Berwick upon Tweed is the closest English town to the Scottish border. As this picture shows, it lies where the River Tweed meets the sea. It is heavily fortified; the town passed between English and Scottish ownership 14 times before it was granted status of a free town in 1482. The print shows the 17th-century bridge over the River Tweed leading to the town key. 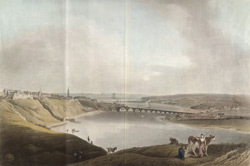 The middle of the bridge marks the outer boundary of the town.This is a coloured copy of a plain print of the town.